My SIL sent me this pic today. 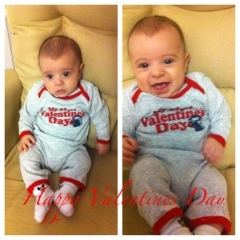 Baby M was excited for V day too! Husband and I had the whole weekend dedicated to Valentines Day. It started Friday night with Dinner and a movie. We went down to our old neighborhood to my favorite Thai restaurant. Had our favorite dishes, Red coconut curry shrimp and pineapple and shrimp Pad Thai! It was HILARIOUS!!!! So many laugh out loud moments! I love Adam Sandler and Jennifer Aniston. It's a feel good romantic comedy. My favorite kind of movie!! We didn't make reservations Saturday night for a dinner, we didn't think anything of it... Until... Every restaurant we tried to go to in our neighborhood turned us away! No reservation, sorry we can't take you. Eeek! And there was one restaurant in my area that we've been wanting to go to for soo long! We were like sad puppies leaving it ha! Then today my husband surprised me! with reservations to that restaurant!! Oh he knows the way to my heart. We had a lovely Valentines day dinner tonight. The restaurant atmosphere was so romantic. Candle lit, soft music, great food. The most romantic part... our wedding song was playing as we were leaving. Perfect evening. Today is our gym night but my sister is busy baking away for all the V day orders she has. I haven't posted pics of my little niece for a while. Look how big she is! She'll be 6 months next week! Hope you all have a great V day weekend!